“Empowering Women Through Politics: How & Why?” is the theme for the 8th Annual Women’s Power Summit at the Bucks Club in Jamison on Thursday, Oct. 18. Sponsored by the Bucks County Bar Association Women Lawyers Division and the League of Women Voters of Bucks County, the summit focuses on the reasons women are under-represented in Pennsylvania government and what can be done to address the imbalance. Pennsylvania currently ranks 49th in the nation for female representation in government, say organizers. 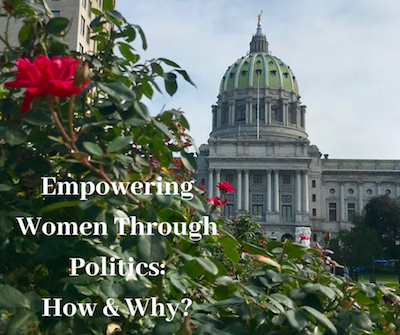 Guest speakers will participate in an interactive panel discussion and presentation exploring the ways in which under-representation in Pennsylvania government affects women and the community, and how citizens can become more involved making a change. Panelists are Jennifer Herring, C.P.A. and Doylestown Township Supervisor, Kathy Beveridge, President of the Bucks County Women’s Advocacy Coalition, and Kadida Kenner of Why Courts Matter – PA. The presentation will be moderated by Charissa J. Liller, Esq., Chair of the Women Lawyers Division of the Bucks County Bar Association. Lawyers in attendance will be able to earn 1.5 CLE credits. The program begins at 4 p.m. on Oct. 18 at the Bucks Club, 2600 York Road, in Jamison. A cocktail reception follows the presentation until 7 p.m. The cost for the event is $35. Contact Michelle Froelich of the Bucks County Bar Association to RSVP at michellef@bucksbar.org, or register online.